Arnold Sports Festival at Sandton Convention Centre, Sandton Central from Friday, 17 to Sunday, 19 May 2019. 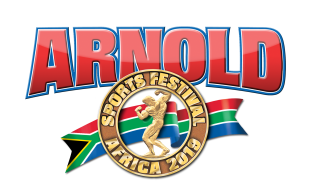 Three years ago, four South African bodybuilding and sports enthusiasts collaborated to make the Arnold Sports Festival a reality on the African continent under the broad theme ‘My Sport, My Passion’. In partnership with the Gauteng Provincial Government and the SA Sports Confederation and Olympic Committee (SASCOC), Arnold Classic Africa affords athletes the opportunity to compete in an international competition, against participants from all continents, in Africa. Like its global counterparts, the African rendition embraces numerous sporting codes and promotes these through demonstrations, contests, record attempts and sports celebrities over three days each May.